Pocket Dice is an online casino offering a fast-paced dice game, which lets players bet on whether their roll will result in a total that is ‘under’ or ‘over’ the selected number. The site only accepts deposits via bitcoin, which ensures instant deposits and withdrawals for easy banking. Newcomers can claim a 100% welcome bonus, while regulars can enjoy free bitcoins every hour, frequent tournaments and a lucrative referral scheme! Established in 2014, Pocket Dice offers players an intriguing dice game to bitcoin players. The idea is a simple one and the premise works well. This is a simple online casino and mobile casino offering with just one game available to play. Although it sounds too basic for anything too entertaining and online casino fans will raise an eyebrow at their idea of a site with only dice games, there are many regular players who love to come back again and again – so there is definitely something worth exploring here! 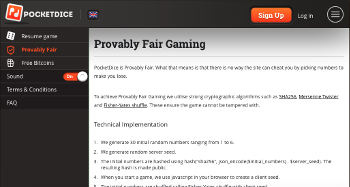 Pocket Dice is fast-becoming a popular option with online dice gamers and bitcoin players. As with most online casinos, there is a welcome bonus for newcomers giving you 100% extra on top of your first deposit at the site. After this you can also claim a second-deposit bonus, while there is also a Bitcoin faucet which gives away free money every hour. The only payment method accepted here is bitcoin, so you know all payments are instant and that banking is highly efficient with this smooth digital currency. This site is available across the world with players from most countries able to play here with the exception of the USA. To go along with the international feel, there are three languages supported here and you can communicate here in English, Russian and Chinese. Simply use the language selector to pick your preferred tongue. Pocket Dice Casino gives no details of its licensing arrangements, so this could be slightly off-putting to players looking for this information. However, despite the lack of basic information, players are told that the games are provably fair as they are tested and audited by a third party. The Provably Fair Gaming page at the site also tells players that all results are created using cryptographic algorithms such as SHA256, Fisher-Yates shuffle, and Mersenne Twister. Security is also an important feature of the site with two-step verification available on sign in. The dice game at Pocket Dice might seem much too simple to be engaging to many casino players, but you would be surprised. In fact many gamers have arrived at the site waiting to be disappointed but they find hours of entertainment! 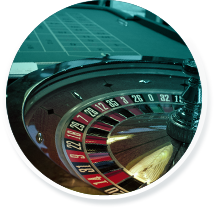 The reason is simple – the dice game is engaging and there are many ‘extras’ to keep players at the site, such as promotions and other gambling opportunities. It is true that players looking for a range of casino games, such as slots, table games and video poker will not be satisfied by the options here. However, this all-rounder casino player is not who Pocket Dice is trying to attract – although they could be converted! On entering the site you will see an attractive green background with dark grey menus. You can click the red button to sign up while regulars can log in easily from the home screen or using their Facebook account. You can pay here straight away by picking your stake and then opt for ‘under’ or ‘over’ to bet whether the next dice roll will be higher or lower than the selected number. The chosen option will turn dark grey when selected. 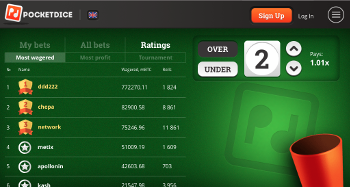 The main page has a menu with ‘bets’, ‘tournaments’ and ‘ratings’ as options. You can also look under ‘my bets’, ‘all bets’ and ‘high rollers’ to explore further your own bet and those of other players. The side menu gives access to other areas of the site, such as the bonuses page, the free bitcoin faucet, the provably fair gaming page, terms and conditions and FAQ page. New players at Pocket Dice Casino have a 2-tier welcome bonus to take advantage of when they join up and make their first deposits at the site. The first deposit bonus you can claim is 100% on top of your deposit up to 1 BTC. After this, you can also claim 50% on top of your second deposit up to 0.5 BTC. Although these bonuses are good, they have a ridiculously huge wagering requirement of 700x attached to them before you can withdraw your cash. So you need to wager 700 BTC in order to be eligible to withdraw your 1 BTC bonus. Plus this wagering needs to be completed within 30 days, which makes it incredibly difficult. Perhaps a better bet in terms of promotions is to use the referral program bonus, which gives you 0.1% cashback on every bet made by your referrals. This is an interesting affiliate relationship in that it is not 0.1% of the site’s profits from your referral you get to keep, but 0.1% of their bets. So this could be a generous offer if your referrals make regular large bets – even if they keep winning. Another promotion at Pocket Dice offers you free bitcoins from the bitcoin faucet. This provides every player with 1,000 satoshis (0.00001 BTC) every hour. The free bitcoins are available to all players, but if you make regular deposits or link back to the site from elsewhere you can claim even more free money. You can use the faucet up to every 10 minutes to get free bitcoins. There is a convenient notification setting which allows you to get notified by the site whenever more free bitcoins become available. Play a Unique Dice Game – and Gamble Your Winnings! Pocket Dice Casino offers gamblers a unique dice game especially for bitcoin players with a house edge of 1.9%. You will discover this simple game as soon as you open the site. All you need to do is to bet on ‘under’ or ‘over’ to gamble on the outcome of the dice roll. This simple dice game is the main game available at Pocket Dice Casino, however after any game you also get the chance to gamble your winnings on an additional 50/50 dice game. To play the main dice game, you need to pick a total amount, which can be any number from 2 to 12. You then place your bet on whether you think the dice roll will be under or over this amount, according to a range of set odds. You then roll the two dice and the result determines your payout. If you roll the same number as the set number, the result is counted as a loss. The odds are in decimal format with set results. You can earn 1.01 for a bet which is almost guaranteed (such as ‘over 2’), which gives 1 unit for every 100 units bet. Less clear-cut results can pay better odds with a top reward of 35.3 for the least likely outcomes, such as ‘over 11’, a bet which will only leave one number to win on. As soon as the results are in, your winnings will be added to your account or your losses taken from your account. So you can always see your money situation immediately. After any winning roll you also get the chance to play another gamble game, which is a 50/50 shot of doubling your money – or forfeiting your winnings. Slots players will be familiar with this concept! To gamble, you need to pick 3 of the 6 sides on a die and if the next roll matches you win – but if it doesn’t you lose your cash from that game. This simple dice game and following gamble game are the only games available at Pocket Dice Casino. This means that punters who are searching for roulette, blackjack, poker or other casino games will be disappointed, as this is definitely not the right site for you. However if you are looking for a simple site with a fun dice game where all your gambling is with bitcoins, this could be a perfect choice! Pocket Dice is only available as a bitcoin casino. You cannot gamble using any other form of currency other than this popular cryptocurrency. Although this could feel restrictive to some, this bitcoin angle is the perfect unique selling point that makes Pocket Dice stand out in the online casino world. As bitcoin gets more and more popular among gamers, the sites which specialise in this useful digital currency are getting quite sought after. Pocket Dice has lots of advice on how to deposit and gamble using bitcoins on its FAQ page. To explore the security information you can head to the Provably Fair Gaming page which is accessible from the left side menu. The site uses the cryptographic algorithms SHA256, Fisher-Yates shuffle and Mersenne Twister to ensure perfectly fair and random results in every single dice game. The site also assures players that it is safe and secure with optional two-step verification run by Google helping to assure players that security is taken seriously. The sign up process at Pocket Dice is simple. You can open an account by filling in the simple sign-up form or by signing up through your Facebook account. As soon as you have your account you can start playing for free by taking advantage of the free bitcoins available from the faucet. You can instantly claim 1000 satoshi and then claim another 1000 one hour later. You can get more free bitcoins by making your own deposits or by posting backlinks to the site on social media pages. These free bitcoins are not worth a lot of money but as this is free cash it is a great way to play the game without having to deposit any money of your own. If you do want to make a deposit at Pocket Dice, you need to click on the plus sign next to your account balance. You will get a bitcoin wallet address which you can use to deposit bitcoins to your account. You can make instant payments using bitcoin and this will show up in your balance straight away. The max bet is 20 BTC per dice roll. The minimum withdrawal at Pocket Dice is 0.5 mBTC and there is a transaction fee of 0.2 mBTC, which is deducted from the withdrawal amount. In addition to playing on your computer, it is also possible to play on your mobile phone or tablet for a fully optimised dice game on the move. In fact, the simplicity of Pocket Dice makes it ideal for mobile gaming. Although there is no dedicated app, you can play the dice game at the website directly in your browser on your mobile with no need for downloads. The dice game is optimised for mobile play with clear dice rolls and a simple display. The menus and game screen are optimised perfectly for mobile screens, letting you browse the site easily and place bets from your Android device, iPhone or tablet. Pocket Dice is an attractive bitcoin casino designed for dice players looking for simplicity, community and free bitcoin gaming. You will find only one game here and only one currency, so options are severely limited – but this is not a criticism. Instead of a limited site, we found a simple and fun game with plenty of ways to enjoy free gaming. You can enjoy a decent welcome bonus, although wagering is absurdly high, while after this you can get free bitcoins every 60 minutes. With the tournaments running regularly and a strong community aspect, the site feels surprisingly fun and involving. The design of Pocket Dice is user-friendly and intuitive, while the dice game is simple to get the hang of and much more fun than it first seems. The customer service team can be contacted by email or contact form only, so you might find it more useful to ask other more experienced players any questions in the chat box. This chat box brings a social element to the site and creates a strong community spirit. Along with the potentially lucrative referral scheme, perhaps the most attractive part of the site it the bitcoin faucet with the free bitcoins raining down every hour! Overall, Pocket Dice is one of our recommended Bitcoin casinos thanks to its free money opportunities, surprisingly fun dice game and involving social aspect.